The latest features added to Peshk@ include 5×5 “helper” boards and exercise transformations, such as those found in CT-ART (see October 2006 and November 2006), effectively increasing the number of training positions. With these additions Peshk@ can handle all the different types of exercises that are available in existing ChessOK training courses. Note that once a training feature has been added to Peshk@ it can be used in any course designed for the program. This means, for instance, that all the CT-ART specific training features will be available to Peshk@ training course authors in the future. This is one of the advantages of Peshk@ over the old approach where a different program was required for each training course. In this column I’ll focus on how to get started with Peshk@ and how you can download and try out demo courses. I also cover how you can purchase additional training courses. For a quick introduction on how to train with Peshk@, see my April 2009 column. You can purchase Peshk@ along with a training course from your favorite chess shop. It’s available on DVD and for download. Peshk@ itself is freeware. You only pay for the courses. You can download the program and some demo courses and try them out before you decide to purchase anything: Free Peshk@ download. After downloading, run PeshkaSetup. This is a standard Windows installation program. Follow the instructions and you should complete the installation without a problem. If you select the installation defaults, the program will be started after the installation is completed. The first thing you are asked to do is to create a user profile by entering your name and estimated Elo rating. Here the user has selected the name Alan and an estimated rating of 1200. For a discussion of how this information is used by the program, see my April 2009 column. After filling out this form, click the Create button to create your profile. Since the free Peshk@ download doesn’t have any training courses installed, you are next shown the Course Browser for installing the first training course. Here Peshk@ shows you a list of available demo courses that you can download free. These are all samples from actual training courses and you can upgrade to the full course at a later time. If you previously purchased one of these training programs, you can upgrade them for use in Peshk@ here. Otherwise you should take advantage of the demos to find the courses that will help you improve most. We will have a closer look at the Course Browser later in this article, but now we need to install the first training course. A course listing with basic information is shown below. Here we see information about “Complete Chess Course.” First we notice that it is clearly marked as a demo. The icon on the left has “DEMO” stamped on it and the same text follows the name of the course. The second line shows that the course was authored by Convekta. We also see that it is aimed at players with a rating between 1200 and 2000 and that it is in English. If you click the course listing, you get a more detailed description as shown in the image below. Following the information about the training course there is a download link on the right-hand side of the screen. When you click the “Free download!” link, the course will be downloaded and automatically installed in Peshk@. Note that the course is also automatically transferred from the “Free Online” category to “Installed,” so you can always see which courses have been installed. The numbers in parenthesis, following each category name, show the number of courses in that category. In this case we have installed one training course and there are seven more free courses available for download. The “Installed” category shows courses installed in Peshk@. You can see that the hierarchical course list looks very similar to a list of directories and files in Windows Explorer. It also works the same. You can click the +/- sign in front of a folder icon to expand/collapse the contents of a group, or double click the folder icon itself if you prefer. You can continue and download as many demo courses as you like. After installation is complete, click the OK button at the bottom of the Course Browser and you can start practicing! After trying out the demo courses that you downloaded when you first started the program you may want to download or purchase additional courses. You can always start the Course Browser by clicking the “Courses” button on the “Home” tab as shown in the image. The Peshk@ Course Browser has evolved quite a bit since I first wrote about the beta version. As we saw above, the course browser shows you a list of available training courses. You can see which ones have already been installed and additional courses that are either available for free download or can be purchased. There are already around twenty training courses available, covering various topics. This number will grow as new courses are released and soon there will be an abundance of courses to choose from. The Course Browser has three methods to organize, filter, and sort the training course list, ranging from predefined grouping and filtering options to full control over all options. The six “Group by” and “Show courses” buttons offer the simplest method of grouping and filtering the list. The highlighted (orange) buttons show which options are selected. In this example, the courses are grouped by “Status.” This means that we would get one group for “Installed” courses, another one for “Free Online” courses and the third group with “Online” courses, i.e. courses that you can purchase. In this case, however, the “Online” courses won’t be displayed at all since they are excluded in the “Show courses” filter. These are the choices that were used to display the courses in the Course Browser screenshots above. A simple method for grouping and filtering courses. If I clicked the “1. Status” button in the screenshot above, I would remove the grouping and the courses would be displayed as a simple list. If I then click the “Difficulty”, “Theme” and “Status” buttons in this order, the results would be as shown below. Here the courses are first grouped by difficulty, then by status and finally by theme. Note that the labels of the “Group by” buttons have changed to reflect the current grouping levels. The “Show courses” buttons simply include or exclude the corresponding courses from the list. If you want more control over the grouping and filtering, you can click the “Filters” or “Advanced” buttons in the upper right corner of the Course Browser window. If you click the “Filters” button, the following screen is shown. The options are divided into the same three groups as the “Group by” buttons we examined above: “Difficulty”, “Status” and “Theme”. In this example, all difficulty levels are included: Beginners, Club player, Intermediate and Advanced. In the “Status” pane, only “Installed” and “Free Online” are selected and that corresponds to the “Show courses” buttons we examined above. Finally, all “Themes” are selected. If you click the “Advanced” button in the course browser, you get even more control over the display of the training course list. As the name indicates, you can use this method if you have advanced requirements for organizing, filtering and sorting the course list. Here you have access to all the options that we saw in the “Filter,” but additionally you can sort the items within each group level and you have access to more fields that you can use for grouping. You can create up to seven group levels, but the screenshot above shows the first two: “Difficulty” (#1) and “Status” (#2). The selection of “Group by” within the “Grouping method” panel for both items shows that they will be used to create a hierarchical list. I have also selected “Sort ascending” for both items. This means, for instance, that the easier courses will be listed before the more difficult ones within the “Difficulty” group. As the following image shows, you can choose from seven different fields for grouping and sorting. Most of these fields are self explanatory. Information about “Status”, “Theme,” and “Difficulty” can be found above (see for instance the “Filters” dialog box). “Author” is the course author, “Package” can be either “Demo” or “Full,” “Elo Rating” corresponds to the rating range for which the course was designed and “Language” is the course language. Note that the same course can fall into more than one category, so it may be listed within more than one group in the hierarchical list. An example is a training course that covers both strategy and tactics. Before you can purchase additional courses you need to register. Start by clicking the “Users” button in the “Tools” tab as shown here. The “Switch user” panel will be displayed. Click the link in the “Online information” column as shown here and then the “Register now!” link in the login dialog. The registration dialog box will appear. Choose a login name and password and enter your email address. When you have finished filling out the form click “Register” to complete the registration. After a successful registration you will be automatically logged in and should see the following message. Here you can click “View Courses” to open the Course Browser. Notice that the text at the top of the window has changed and now shows your current balance and a link to top up the balance. Before making a purchase you need to add some money to your account. You can do that by clicking the “top up balance” link. This takes you to the ChessOK website where you can buy a Peshk@ payment card. I paid for the payment card with PayPal, which allows immediate download (you can buy more than one payment card in the same purchase). After confirming the order I switched back to Peshk@ and opened the Course Browser. I decided to purchase the Complete Chess Course, which I downloaded above as a demo. After locating the Complete Chess Course in the Course Browser, I clicked the purchase link, shown in the image above. The course was automatically downloaded and installed and the purchase link was replaced with a text confirming that as shown in the next screenshot. 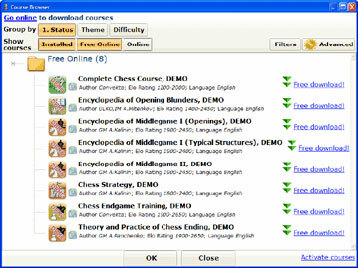 The Complete Chess Course is now ready for use and you can start training! For a quick introduction to some of the training features, see my April 2009 column. After installing several courses, you can use the Course Browser to select a course for training. Click on an installed course to highlight it and then click the OK button. The selected course will be opened for training and a list of training tasks/lessons will be displayed in the navigator window. If you bought your training courses on a DVD, you need to activate them after installation. This is also done through the Course Browser. Peshk@ is the next generation of ChessOK’s training programs. When you are ready to activate the course, click “Activate installed” or “Activate courses” and enter the activation code. The DVD package comes with an activation code. Buying a download version of Peshk@ with a training course works similarly. In that case the activation code will be emailed to you.